Our family journey (and let me tell you, it was quite the journey) to minimalism all started with cloth diapers. 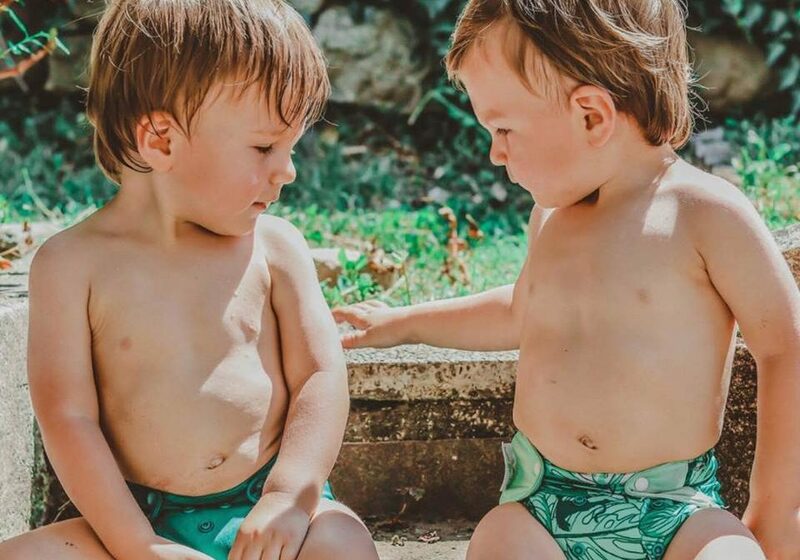 We were dead set on getting rid of disposable diapers once and for all but I was horribly frightened of the stress and work that cloth diapers would bring to my life. I am thrilled to tell you that the journey has been more than I ever imagined! We love our cloth diapers! Cost! Using cloth diapers will save you approximately $2000 per CHILD. Need I say more? Protect the environment! 18 billion diapers are thrown into the U.S. landfills each and every year. One adorable baby is responsible for over 5000 diapers in their lifetime. A single use disposable diaper takes 200-300 years to biodegrade. This is absolutely ridiculous and we need to change this ASAP. Sodium polyacrylate – found in the fluff layer of the disposable diaper, turns your baby’s urine into gel; it can absorb 100 times its weight in liquid. Sodium Polyacrylate has also been linked to Toxic Shock Syndrome in tampon use and has been associated with severe diaper rash. Dioxin – one of the most poisonous and carcinogenic substances produced on earth, has been associated with birth defects, miscarriage, cancer and genetic damage. Dioxin is banned in most countries, but not the United States. Tributyl tin (TBT) – a controversial chemical compound. A study by Greenpeace confirmed TBT in major name-brand disposable diapers. Greenpeace found that TBT causes hormonal problems in animals and humans, and they are demanding a world-wide ban. New designs and ease! Long gone are the days of safety pins and rubber/vinyl pants. Cloth diapers are a one-stop shop made with velcro and snaps, and material such as wool, nylon or polyurethane laminate. The diapers are fitted with elastic which makes them fit like a glove and prevent leaks! The diapers are comprised of a waterproof outer layer and an inner layer of fleece, suede cloth, or organic cotton (these are important things to consider when choosing your cloth diaper! We love organic cotton). The layers are sewn together and have an opening where you place the diaper insert of your choice. Easier potty training! Disposable diapers, unless left on for far longer than the recommended time, keep the baby completely dry. The moisture is sucked away and the child rarely feels the discomfort of the wetness. Now…if you think about it, what incentive does your child have to begin using a potty if they feel dry all the time? Cloth diapers allow the child to feel what is happening and communicate with us. At about 11 months old, my children would point to their diaper for changing, and now at 18 months old, they come right up to me for a diaper change (rather demanding as well! haha). Diaper rash be gone! Before the 1950s (when cloth diapers were number 1), only 7 percent of babies had diaper rash. Nowadays, the number is at about 50% or more. Cloth diapers are changed more frequently, have zero harmful chemicals, and allow your child’s bum to breathe. My eldest son, Alessandro, had a horrible rash from using disposable diapers. Once we made the switch, the diaper rash never came back again! Resale value! We purchased 13 of our cloth diapers USED and for a pretty good price (for us and the seller!). These diapers look brand new and we plan on using them for many many more years! Inserts can be used for almost anything! The inserts that we love are absolutely amazing. I purchased a few too many and use the extras for that time of the month. Yes…I just said that…I use the inserts as my own reusable pads. No shame over here – the best pads I have ever used in my life! Why I was so SCARED to start! I remember finding our chosen brand on a Facebook cloth diaper selling page and I jumped the gun without much thought. “We have to do this”, I kept telling myself and as soon as I received the bag I felt completely overwhelmed. “Oh no…what the hell do I do with these things? !” was my first thought haha! We spent about a week testing them out and watching as many youtube videos that I could get my hands on to learn the tricks of the trade. At the end of that first week, I was a cloth diapering PROFESSIONAL. I had all the tools I needed and it did not stress me out or add any significant amount of work to my day. Phew!!! Rinsing is the first step to washing your cloth diapers. If soiled, use a toilet hose first and rinse off in the toilet. Add no more than 12 diapers to the washing machine and run through a pre-rinse in cold water with no detergent. Use the regular hot water cycle option and pair with a trusted detergent like Allen’s Naturally. Be VERY careful about detergents – the wrong one could destroy your cloth diaper and cause leaks and smells. Hang dry (hammock style) or toss in your dryer! If using a velcro cloth diaper (I love them! ), be sure to use a low tumble dry or hang dry. Choosing a well-made and trusted cloth diaper is key to success. I researched for hours and hours before finally deciding on the Bum Genius brand. I was able to snag 13 cloth diapers for $100 on a Facebook Cloth Diaper group (retail about $280)! I highly recommend finding your cloth diapers used for the best deal, but you can also purchase Bum Genius online through Amazon and feel good about it! Cotton Babies, the makers of bumGenius, is committed to fighting poverty in local communities by providing needy families access to reusable cloth diapers through their national Share The Love cloth diaper bank. The next step is to find very high-quality inserts. These will simply go inside the diaper of choice and hold most of the moisture. These bamboo inserts are HEAVEN. I went through about 5 different brands and types and this one was the keeper. I use these for way more than cloth diapering too – they are fantastic! Your child will not need these until they are off the breast milk and onto foods (about 6 months and up). If your baby is formula fed, you will need these right away. Here’s why: When breastfed babies poo, their waste is water soluble! You can put the diaper straight into the rinse cycle and then wash as normal. With formula fed and introducing food, the waste is not water soluble and must be rinsed off. These liners catch the waste and then you simply lift off the diaper and flush into the toilet! These little guys work wonders. For the first 4-5 months I used old cut up t-shirts and towels with water (which is absolutely fine! ), but I was gifted these by a dear friend and fell in love. Simply add water and you have a baby wipe instantly! These are reusable and can be used for so many things. I keep a few in my bag, a few in the car, and a few in the first aid kit just in case. These are wonderful for holding the dirty diapers and not having to worry about leaking or smell. I keep one of these bags in my stroller at all times and also have on in the nursery for busy days. If my day is super relaxed, I rinse on the spot, but sometimes I need to keep these in the bag to get work done and rinse at bedtime! Also great for when friends/babysitters have to change the baby – I wouldn’t expect anyone else to want to deal with all of that haha. This is something that you may not NEED but you will kick yourself for not getting. I promise you. While the liners pick up most of the waste, sometimes you have a sick baby on your hands and it is just a mess, am I right? This hose connects to your toilet and rinses of the diaper, straight into the toilet, without any work in between! Plus, you get your very own bidet (which is quite uncommon in America) so you are WELCOME haha!! I hope this answers any questions that you have about cloth diapering! Such an informative article. Things have changed since I have had my babies. My daughter is due with her first baby in 3 weeks. I will definitely be sharing this with her. Thanks so much! You are so sweet Tammy, thank you! Congratulations on becoming a grandma, that is so amazing! Lots of love, kisses and hugs to your family! This is such an informative post, when my daughter was younger I was scared to use them. This gives a better understanding of benefits and answers so many questions! So funny, cloth diapers were a must when we were growing up. In fact, I don’t recall ever seeing my mom use disposable diapers. I’ll have to remember to show her this post. I’m sure it will bring back memories. I think many moms should consider doing something like this. I like how it is child safety and natural. This is a nice and old school way of doing it. You got me at “save $2000 per child”, you need not say anymore. We shall definitely be considering this option. Thanks for sharing! Thanks for your honest review on cloth diapers. I thought these days no one is using cloth diapers anymore. I guess the cloth diaper time has come back. I am a ’93 kid and that time cloth diapers were a must when we were growing up. However, indeed this is an informative post. I know people try to avoid them but i agree with you they are very healthy for the skin. Love the info you provided, thank you. I would never have thought about the wetness factor when considering whether or not to do cloth or disposable. I get what you are saying that it does give a child and incentive to try using the potty more quickly, which is an advantage. My mom used cloth diapers for all of us because I was allergic to the disposable ones available at the time. I still remember the service coming to pick up and drop off diapers for my brother when he was a baby.